Kutch Desert Wildlife Sanctuary is one of the largest wildlife sanctuaries in India and spans an area of about 7500 sq kms. Kutch Desert Wildlife Sanctuary is around 320 KMs from Ahmedabad & 110 KMs from Bhuj, is most famous for the thousands of Flamingoes that nest and breed. 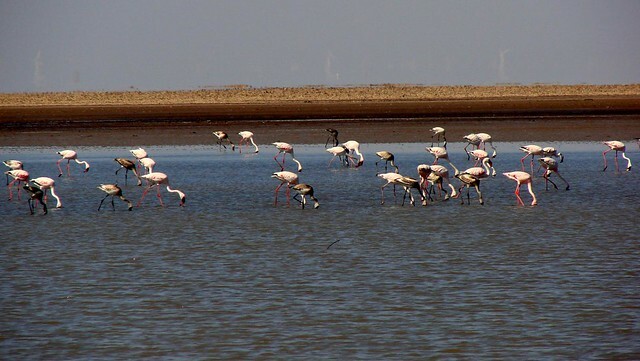 This flamingo gathering, popularly known as 'Flamingo City' is located in the mudflats of the Rann of Kutch. During the rainy season of June to September, saline wetlands have an average water depth between 0.5 to 1.5 mts. By late October rain water dries up, making it a saline desert with big white salt pans. Kutch Desert Wildlife Sanctuary also has some of the wild animals like Hyenas, Jackals, Mongoose, Spiny Tailed Lizard, Indian Porcupine, Nilgai, Chinkara, Sambhar, Wild Boar, and Pale Hedgehog. Amongst birds, Greater flamingo, Lesser flamingo, The Great Indian Bustard, Spoonbill, White Pelican, Pintail, White backed vulture, Black vultures, Black-necked storks, Cormorant, Indian cormorant, Brahmini duck, Shoveller, Pochard, Sandpiper, Gulls, Terns, Stints, Painted sandgrouse, and Raptor etc. are found in the sanctuary.